1 – Liquidity. Investors like liquidity. It allows for keener pricing, better price discovery, and it allows significant sums to be put to work. Indeed it is one of the perversities of financial markets that investors are in fact in most cases served better by a smaller number of deep pools of liquidity than a fragmented market place. 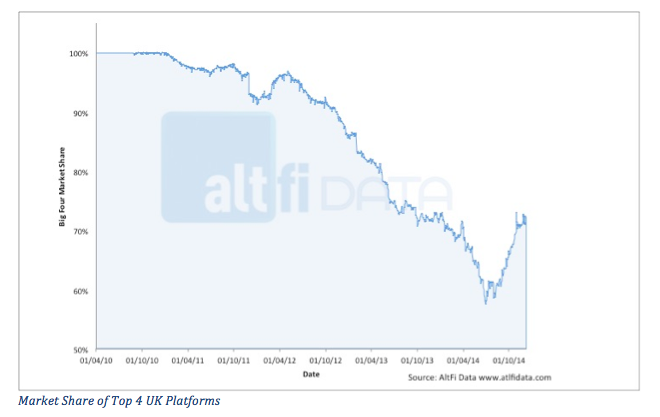 Platforms are effectively pools of liquidity. It is therefore inevitable that market share will, entirely logically, gravitate towards the biggest. Because it is the biggest that will offer the best liquidity. Compounding this trend is the emergence of secondary markets. The biggest platforms in turn tend to have the most active secondary markets. Secondary market liquidity hugely increases flexibility most crucially by allowing investors to get out if they want to crystalize cash. This provides a huge embedded advantage to the established platforms and could clearly turn into something of a virtuous circle. 2 – The search for liquidity has in turn been accelerated by the arrival of institutional capital. In October AltFi Data demonstrated that institutional whole loan lending activity on Funding Circle could be identified by calculating the proportion of whole loans as a proportion of total lending from the loan book that Funding Circle make available to all investors. The graphic below illustrates the point and it is very interesting to note that the arrival of whole loan investments on Funding Circle in May of this year very neatly leads the rebound in market share for the big 4 that started in late June. A very significant proportion of any institutional activity is likely to be P2P GI, which represents the fist permanent capital vehicle investing in the sector. 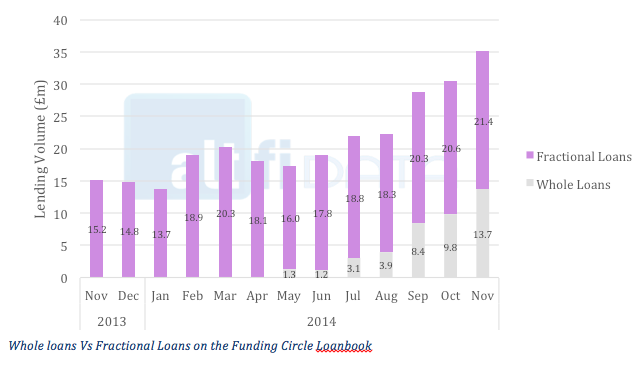 P2P GI’s deployment formally began in June after their IPO but it is very likely that they started test deployment with internal funds in May – exactly as the Funding Circle loan book analysis would suggest. 3 – Perception of Safety. As well as liking liquidity investors also like security. In fact, just as liquidity can make the dynamics of market share behave in a way that favors big and established players, perceptions of safety can have a similar effect. Savers will inevitably favour big, well established entities, as a place to put their money. The ‘too big to fail’ debate has long struggled with this idea. Big is a systemic and regulatory head ache. But big will always trump small in terms of the simple perception of security in the eyes of the saving public. This logic is as true when considering an alternative finance platform as it is when choosing a bank. If a consumer is faced with a well established platform that has proven methodologies and processes for dealing with default and recovery, and collecting and distributing cash-flows, it is entirely logical that they should favour that over a new entrant that has yet to prove its pedigree. 4 – Loan origination. To grow successfully platforms must strike a balance between both increasing amounts of capital to loan and increasing appetite to borrow. The first three factors that we have explored relate to growth of capital to loan. But at least as important for a platform is securing a steady stream of new borrowing requirements of a quality that match investor risk appetite. In this regard the large platforms are blazing a trail. Not only does their established position make them the obvious landing place for prospective borrowers, but in recent months they have also each secured origination agreements. Zopa are working with the Flow Group to fund customer boiler purchases. Ratesetter are working with giffgaff to fund customer handset purchases. MarketInvoice have an extremely clever partnership with Xero – a provider of accountancy software – that allow them to access SME’s. Funding Circle have numerous tie ups including one with Santander. These loan origination agreements will ensure that these big established platforms can offer investment opportunities capable of keeping pace with growing investor appetite. All of this suggests to me that this re-bound may not be an aberration. In fact I suspect it will be the beginning of a trend. At the very least I think that the era of consistent declines in the market share of the big 4 may now stop for a significant period. Indeed after exploring these trends the benefit of hindsight makes it seem screamingly obvious. The conditions seem set to make the big get bigger and the trends behind this all make logical sense. The theme that binds together all of the above factors is that when it comes to decisions relating to finance, entirely logically, we recognize merit in size, and see a value in established entities with greater experience. These very human instincts may be even more telling in a young sector. To my eyes, in the world of p2p lending, big is beautiful – and for good reasons.